Preheat oven to 350. Butter or spray (with cooking spray with flour) 10 wells in a cupcake pan. 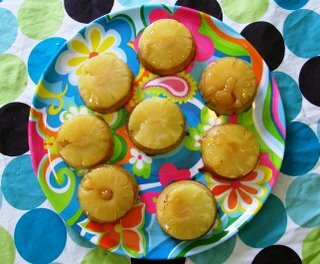 Cut a 1/2 inch chunk out of 10 pineapple slices and place the slices (not the little chunks) individually in 10 cupcake wells. They should lie flat in the pan and look like a "whole" ring again. In a small saucepan, melt and stir together butter, brown sugar and corn syrup. Cook over low heat about 5 minutes or until it thickens slightly. Stir thoroughly to combine. Pour about one teaspoon of this topping into the bottom of each pineapple ring covered cupcake well. In a medium sized mixing bowl, cream together the butter and the sugar until fluffy. Add the egg and vanilla and mix thoroughly. Add the baking powder, mix briefly then add the flour alternately with the pineapple juice. Pour about 1/3 to 1/2 cup of batter over each pineapple slice and bake for 20 minutes. Cool 20 minutes in pan then invert over a baking rack. You may want to place parchment paper or a towel under the rack because they may drip. Serve on a plate, pineapple side up. A friend from out of town is coming over for dinner tonight with her husband and little girl and I wanted to make something fun for dessert that I could make ahead of time. I debated about making a pineapple upside down cake but cupcakes sounded more fun. All of the recipes I found called for crushed pineapple in syrup or pineapple tidbits and a basic yellow cake recipe but this wasn't exactly what I had in mind. What I really wanted were cupcakes with a whole pineapple slice on top, so much prettier than just pineapple chunks or crushed pineapple. I realized that if I just took a little chunk out of each ring I could get them to lie flat in the bottom of each cupcake. I also thought that a buttery brown sugar glaze sounded more appetizing than simple heavy syrup so I made a sugar glaze, adding a bit of corn syrup to keep it from getting grainy. For the cake I made a simple cake batter substituting pineapple juice for milk for extra pineapple flavor. It's not a fluffy cake, but it has a nice texture. I created the recipe to yield ten so you shouldn't end up with much, if any, pineapple slices or bits of juice leftover. I was pleased with how well my first attempt came out. They are simple, not too sweet and very pineapple-y.